“I Feel Badly”: Argh! No, You Don’t! It’s an occupational hazard of proofreaders that we sometimes have to control our facial muscles when listening to people talk. After all, correcting grammar in casual conversation is incredibly irritating, and besides, we’re off the clock. But when the grammar lapses of casual chat sneak their way into formal writing, editors must rise to fight off the encroachment of common errors, slang, and sloppy sentence making. Let’s look at exactly why this is not an idiom, a turn of phrase, a colloquialism, or anything other than a flat-out mistake. As some of us learned from Schoolhouse Rock, adjectives are words we use to help us describe things (or nouns). They tell us how tall, short, big, small, hungry, mean, and sweet things are. Adverbs are words that describe actions (or verbs), and they usually, but not always, end with “-ly.” They tell us how expensively, quickly, grandly, and mistakenly things are done. I feel calmly inside my pocket for my gun. I feel carefully around the inside of the little cave. I feel quickly that I have put on someone else’s shoes. I feel badly with my left hand because I had an accident. The only way “I feel badly” works is if you have some sort of disorder involving your sense of touch (including perhaps a thick pair of gloves). Even so, that’s probably not how you’d phrase it. “I feel badly” cannot work if you mean that you are sick, sorry, or sympathetic. If you are describing the state of an emotional or physical feeling, you must use an adjective. True, but not all words that end in –ly are, in fact, adverbs. “Poorly” and “sickly” are adjectives. So are ugly, wrinkly, chilly, friendly, jolly, likely, only, lonely, and many more. When you feel poorly, you do not have a poor sense of touch that causes numbness; you feel unwell. And here’s the last twist in our grammar tale. 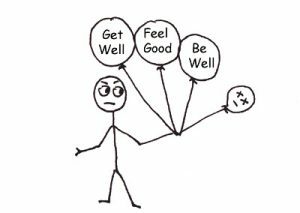 Both “I feel good” and “I feel well” are correct, which seems to suggest you can use an adjective or an adverb at your preference. But “well” is one of those rare words that is an adverb not ending in –ly, and (just to make us crazy) it is also an adjective. When you say, “I feel well,” you probably do not mean that you have an outstanding ability to use your sense of touch. You mean that you feel healthy (the opposite of unwell). So you see, under no circumstances do we describe an emotional or physical feeling with an adverb. “I feel badly” is incorrect except with a highly specific and rare meaning. If your sense of touch is working right, then you feel bad. Which, if that’s the case, I’m sorry, and I hope you feel better soon.